Ardell Accents help "enhance" your already fabulous look. They are shorter than a regular strip lash and are to be used on the outer corners of the eyes for a cat-eyed look. The shorter length is perfect for a natural look with easy, fool-proof application. Accents can be worn for every occasion from formal to casually fun nights out. Use Ardell Lash Accents #308 (61308) to add just a touch of glamour & sophistication. These lashes suit every occasion and are reusable. Best worn on small, large, round, almond and deep set eye shapes. 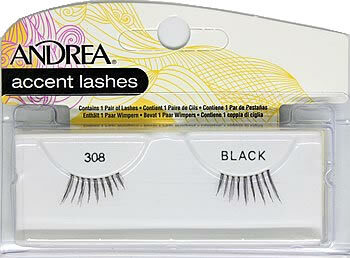 Also try Ardell Little Black Dress lash styles. You don't have to be a professional in order to apply false eyelashes. In fact, even a beauty beginner can have lush, glamourous falsies lashes without a lot of hassle. All it takes is a few simple steps to have your most gorgeous lashes yet! 1. Start with strip lash adhesive. For the perfect look, apply along the rim of Ardell Lash Accents Pair Style 308, leaving glue to air dry for about 20 seconds to prevent excess adhesive on the skin of the eye. 2. After the adhesive becomes tacky, next gently align your #308 lashes direct on top of your lashline to cover your natural lashes. To achieve a non-clumpy finish, press gently. 3. DO NOT start off the natural lashes with mascara. Applying mascara only after fixing the lashes. Apply mascara ONLY on the natural lashes. Next go back in to gently press them together; the mascara will help bond and blend the natural lashes and falsies together even more for a flawless lush lashes look. 4. Go back in with mascara just touch up on the falsies if needed until you get the desired results. I decided to try false eyelashes for a special function I was attending so I purchased some from my local pharmacy and practiced like crazy. Now I don't think I can do without them. These little accents are just great for day-to-day wear, now that I have found Madame Madeline I am ordering a few more different ones to try. I don't think I can go wrong with any of them.